Okay, so this one I picked up more or less purely for the title. 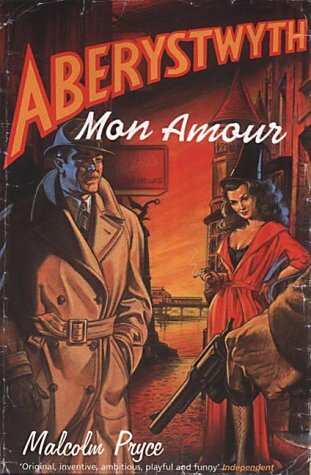 You can't deny that as a title Aberystwyth Mon Amour is memorable and more than a little silly, so why on earth wouldn't I pick it up? Besides, I'd been looking to read some a bit more noir, so this fit the bill in more than one way. 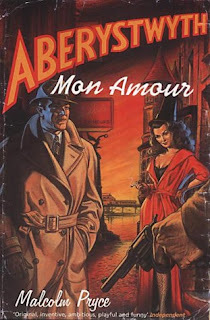 Aberystwyth Mon Amour follows a down-on-his-luck private investigator named Louie Knight after he is visited by notorious singer and bar wench, Myfenwy Montez. She asks him to search for her young cousin, an unpleasant youth known as Evans the Boot. What seems like a simple case soon turns strange, as he finds that Evans is not the first schoolboy to go missing, and that the case may involve the Grand Wizard of the Druids, head of the local school and leader of a seriously shady faux-Mafia group. This book is the most surreal experiences I've had in a long while. Admittedly, when you go into a book knowing that it is Welsh Fantasy Noir, you have at least an inkling that you're in for a weird ride. But then details about the case start coming in and it goes onto a whole other level of strangeness: Druids running the town both legitimately and not, the local ice-cream vendor doubling as the local philosopher/informant, tea cosy shops being a cover for dodgy dealings, war veterans from Patagonia, and much, much more. Whenever I state some of the weird stuff that makes up the world-building in this book, I can't help but be surprised that it isn't more difficult to follow plot-wise. The story itself is remarkably easy to follow; daft as a brush, but surprisingly credible nonetheless. My only real issue with it really is that there are parts of the narrative, the ending in particular, where it feels a tad rushed and could have really used a bit more detail. As for the characters, I feel that some of them deserved more attention, in particular Calamity Jane, but overall they were nicely fleshed out. I'd be more than happy to read the next installment if I were to come across it.